Francis Cecil Allcorn was born in 1894 in Bottesford. Francis Cecil Allcorn’s father, William Allcorn was born in Pembury, Kent. When he was 15 he worked as a carter’s boy in Frant, East Sussex. He married Elizabeth who was born in Frant, East Sussex. By 1881 they were living in a cottage below the bridge on the Elton/Nottingham Road with William working as a railway signalman. Their first son was Arthur William aged 1, born in Bottesford in 1880. In 1891 the family continued to live at what is now described the ‘New Railway Halt on Nottingham Road, Bottesford’. The family consisted of Arthur William, George, Florence, Beatrice and Percy Leonard. All the children except for Percy were at school. In 1901 William and Elizabeth Allcorn were still living at the ‘New Station Cottages’ and William continued to work as a railway signalman. By 1901 William and Elizabeth had 3 more children – Frederick, Francis Cecil and Frank. All of them were listed as scholars. In 1911 the census records that Cecil Allcorn was stationed at Caterham, Surrey at the Guards Depot. He had joined the Grenadier Guards aged 18 years. According to The Methodist Roll of Honour in Bottesford he was wounded on 17 February 1915. August 1914 : in Warley, London District. September 1914 : came under command of 20th Brigade, 7th Division. 7 October 1914: landed at Zeebrugge. 4 August 1915 : transferred to 3rd Guards Brigade, Guards Division. The 1st Battalion suffered heavy losses and was transferred to the 3rd Guards Brigade on the 4th August 1915 by which time he had been wounded on the 17th February. The Grantham Journal for the 27th February reported that Corporal C. Allcorn had been ‘shot through the lung and shoulder and that he was doing well’ in the Boulogne Hosptital. He survived and rose to the rank of Sergeant by the end of the conflict in 1918. Only 4 officers and 200 men survived the initial months of the war and the 1st Battle of Ypres. The 1st Battalion becoming part of the 3rd Guards Brigade, Guards Division, saw action in during 1916 at the the battles of: Flers-Courcelette; Morval. During 1917 in the German retreat to the Hindenburg Line, the battles of Pilkem; Menin Road; Poelkapelle; First Battle of Passchendaele; Cambrai 1917. During 1918 in the battle of: St Quentin; Bapaume; First Battle of Arras 1918; Albert; Second Battle of Bapaume; Havrincourt; Canal du Nord; Cambrai 1918, The pursuit to the Selle, the Battle of the Selle, and the Battle of the Sambre. Ended the war at Maubeuge, France – 11.11.1918. The Absent Voters list for 1918/1919 gives his Service Number as 15065. By then he had achieved the rank of Sergeant in the 3rd Grenadier Guards. His address is given as Wyggeston Terrace. Cecil Allcorn married Lizzie (Elizabeth) Wyer in the spring of 1921. He died in March 1949 in Nottingham aged 55. Francis Cecil Allcorn's only surviving military record is his medal Index Card. This records his entry into active service in France as 23.11.14 as Private. This also indicates that he must have initially served with the 1st Battalion - August 1914 : in Warley, London District. September 1914 : came under command of 20th Brigade, 7th Division. 7 October 1914: landed at Zeebrugge. 4 August 1915 : transferred to 3rd Guards Brigade, Guards Division. The 1st Battalion suffered heavy losses and was transferred to the 3rd Guards Brigade on the 4th August 1915 by which time he had been wounded on the 17th February. The Grantham Journal for the 27th February reported that Corporal C. Allcorn had been 'shot through the lung and shoulder and that he was doing well' in the Boulogne Hosptital. He survived and rose to the rank of Sergeant by the end of the conflict in 1918. Only 4 officers and 200 men survived the initial months of the war and the 1st Battle of Ypres. The 1st Battalion saw action in during 1916 at the the battles of: Flers-Courcelette; Morval. During 1917 in the German retreat to the Hindenburg Line, the battles of Pilkem; Menin Road; Poelkapelle; First Battle of Passchendaele; Cambrai 1917. During 1918 in the battle of: St Quentin; Bapaume; First Battle of Arras 1918; Albert; Second Battle of Bapaume; Havrincourt; Canal du Nord; Cambrai 1918, The pursuit to the Selle, the Battle of the Selle, and the Battle of the Sambre. 11.11.1918 Ended the war in France, Maubeuge. 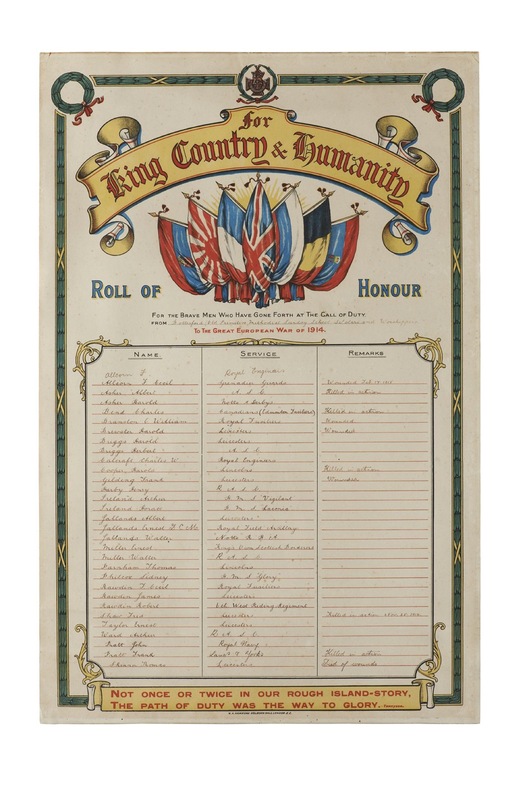 The Absent Voters list for 1918/1919 records he achieved the rank of Sergeant in the 3rd Grenadier Guards.